Don't waste your time searching through a mega store for the belt or bag that you need. Come to Sew & Vac and let our expert staff quickly locate the exact part you need. 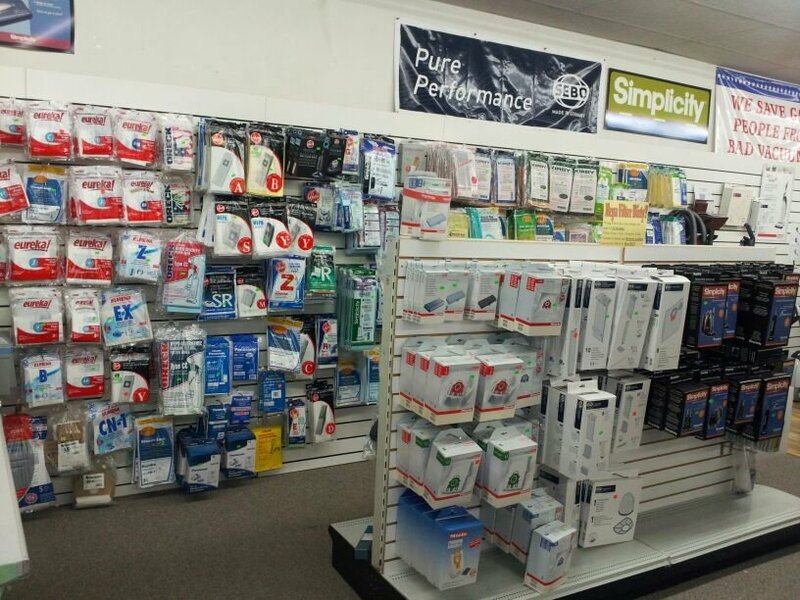 We carry vacuum cleaner parts and accessories for just about every type of vacuum. Whether you're looking for belts, filters, bags, attachments or detergent for your steam vac or shampooer, save time and energy by coming straight to the authority. Sew & Vac. Over the past two years, bagless vacuum cleaners have become more popular in the U.S. compared with the traditional vacuum cleaner. Bagless vacuum manufacturers argue that money is saved because there is no need to purchase bags. Other manufacturers argue differently. One thing is true--bagless technology is not fully understood by most consumers and further explanations are needed. Bagless vacuum systems use a "cyclonic" technology that separates larger dirt and debris from the main air stream and drops these particles into a cup. This cup can then be removed and the dirt dumped into a waste can. The problem with "cyclonic" technology is that only the larger particles of dirt and debris are removed, and the fine dirt exhausts out of the vacuum -- back into the room. To overcome this problem, all bagless machines require filters to capture smaller particles. While it's true you'll save money not purchasing bags, you will have to pay yearly for replacement filters. Bagless vacuum manufacturers recommend changing filters 1-2 times per year. New filters cost $20 to $60 per filter. In addition to this expense, bagless owners complain about having to dump the dirt cup (releasing dirt particles back into the air), unclog the cyclonic filter cup, wash the inside filters on some models, and wash the dirt cup itself from time to time. Plus, bagless machines on the market are built like disposable machines. Demonstrations on bagless machines show that they do an impressive visual job of picking up dirt, and the idea of not buying bags is appealing. That's why sales of bagless machines are rising. On the other hand, a year's supply of vacuum bags (12 bags) costs about $20, and are simple to remove and throw away. With traditional uprights, there's no issue of washing filters or dirt cups. Many industry experts predict that sales of bagless machines will continue to grow, but also predict that owners will soon see the realities, difficulties and costs of bagless systems and revert to using vacuum bags.